Black Metal Stuff; It is everywhere! I apologize up front if this post is LONG and full of pictures. I want everyone to see all that has been accumulated in just a few short years. My point is this stuff is everywhere! 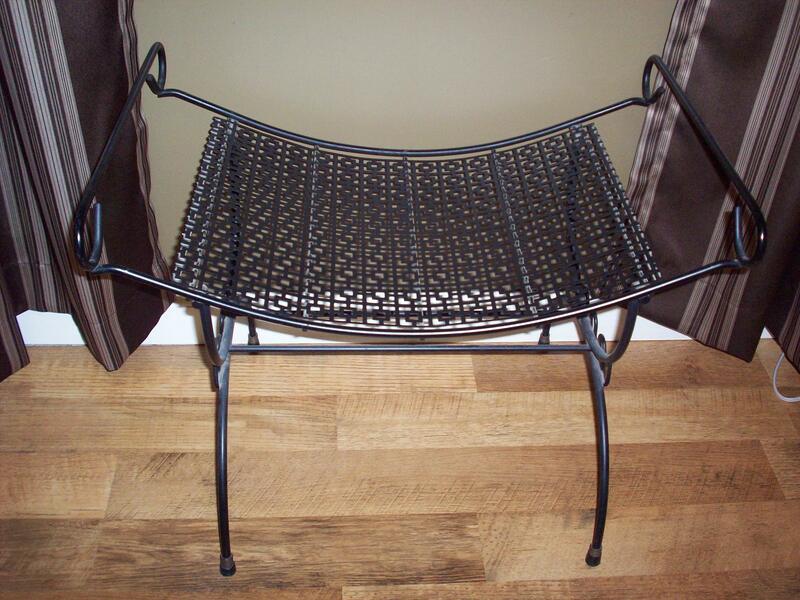 After becoming a Mid-Century convert I noticed that many items manufactured during that era are made of black metal. 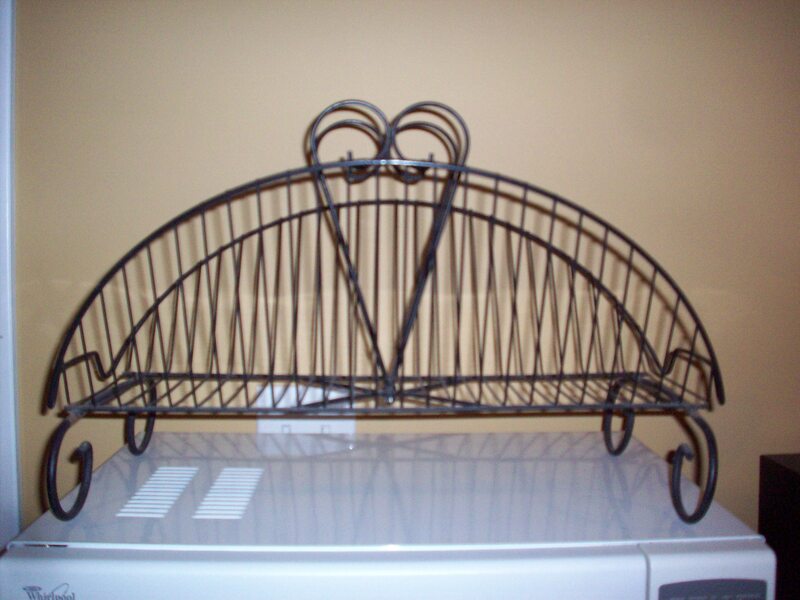 From the living room to the basement, inside and out there was some kind of useful item made of black metal. Was it cheap? Was it easy to produce? Was it lightweight and easy to ship? Did it go with everyones decor? I think the answer to all of these questions is YES! The items that I have picked up are all as useful now as they were then. 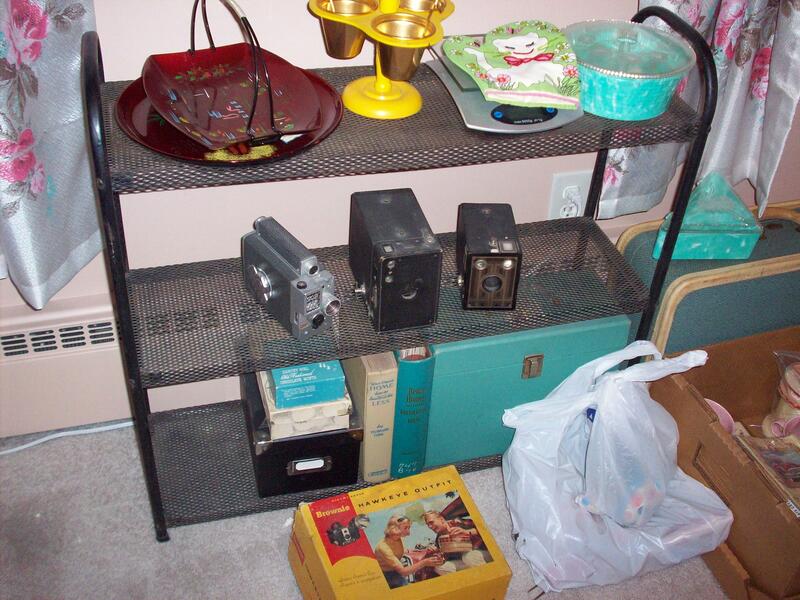 Because the purpose of my blog is to encourage those who want mid-century coolness but have a limited budget, I will state the prices I paid for these treasures. Some are pretty plain and generic looking but others are REALLY fab! You can just scroll down to view my inexpensive black metal bargains. This stand was made to hold a portable record player and crooner albums which were necessary in every basement rumpus room. Its sides were made to look like a lyre. This was $22 at a Mid Century booth at an antique fair. 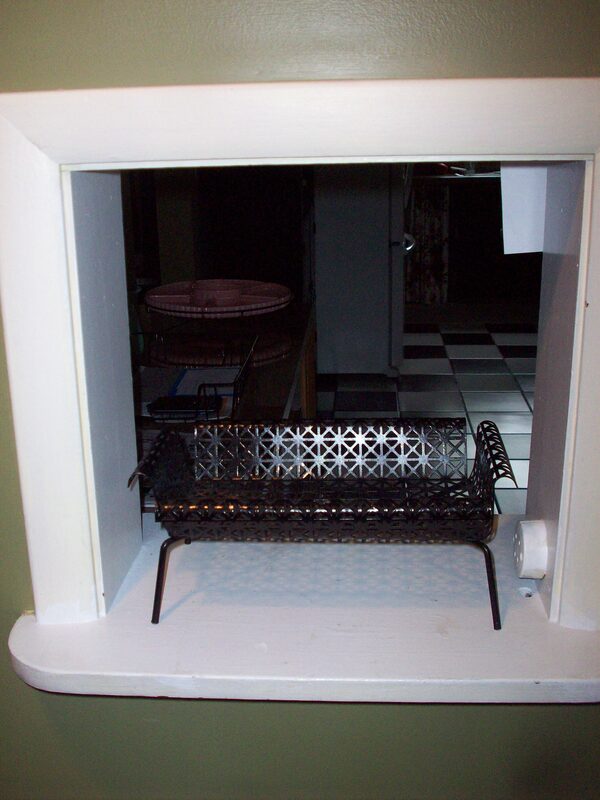 This little vanity bench was a $1 find at an estate sale. The owners daughter told me this was hers when she was in high school in the early 60’s. It is now in our bedroom. 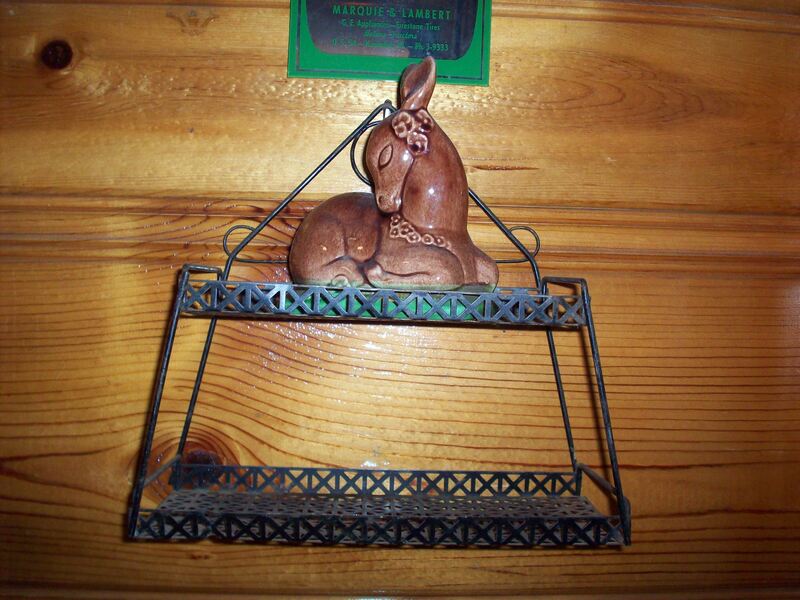 This little shelf was $1 at a resale shop and hangs above my dryer in the knotty pine mudroom How cute is that little deer? I bought 2 of these for $1 each. One is still looking for a home. 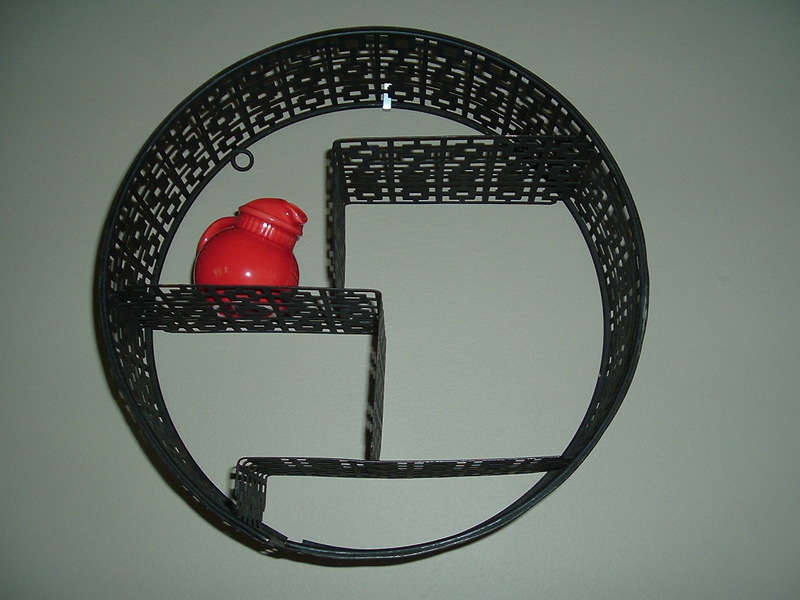 This unusual round one was $8 at my shop and hangs in the kitchen. I am still trying to fill it. This shelf/stand was $1 at an estate sale. 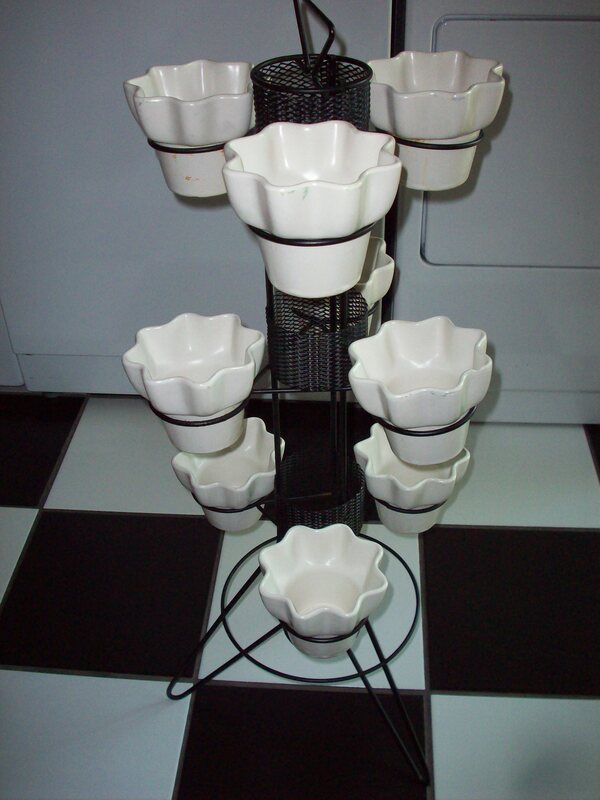 I used it in my mudroom for awhile and now have it in my office. Sorry for the mess; I am getting ready to list some things online to sell. 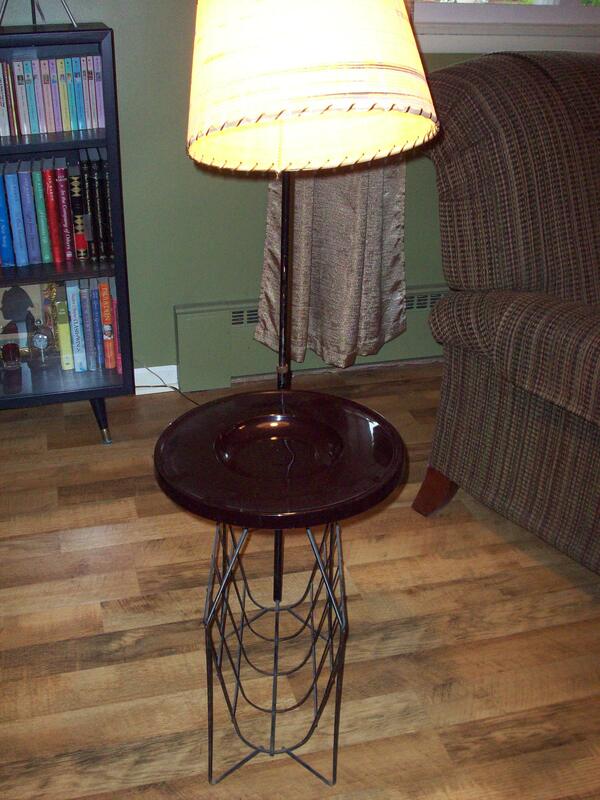 This end table/lamp/newspaper holder was a birthday gift to Hubby a few years back from a moving sale. I paid less than $30. 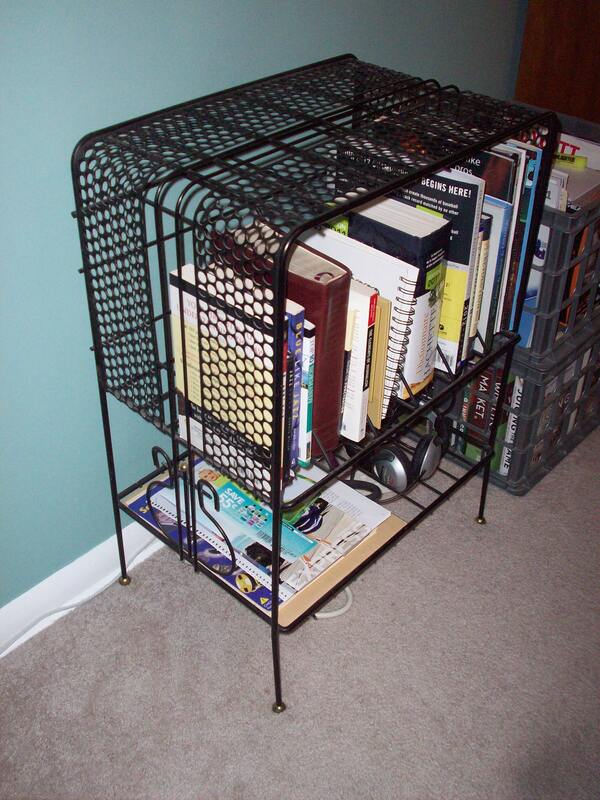 This letter holder was purchased at a resale shop for $1. It was used to hold napkins on the cake table at my youngest sons wedding reception. You guessed it, I was in charge of the decorating and the theme was “Vintage Hollywood”. Talk about fun 🙂 It is now used in this little phone nook by the front door to hold the mail (incoming and outgoing). 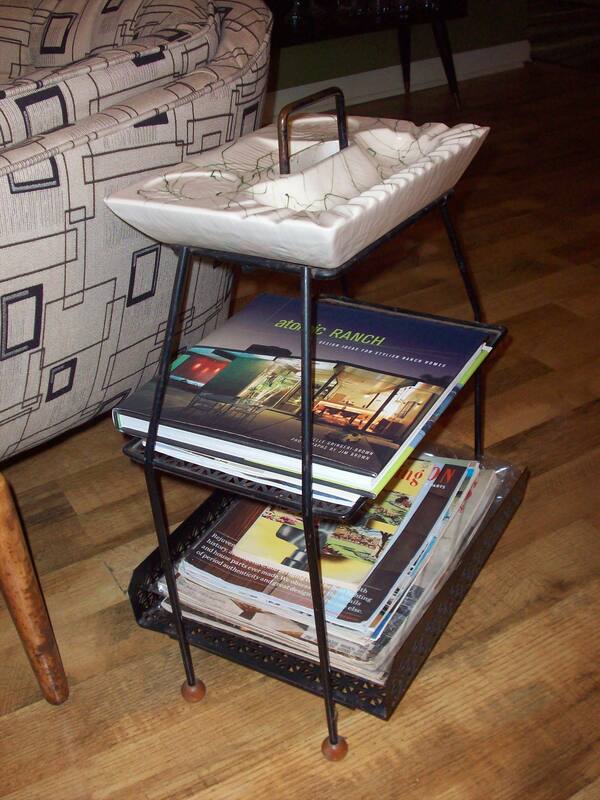 This plant stand is THE coolest piece I have found yet! It still has all the original pottery pieces. I love the hairpin legs! It was $25 at a local indoor flea market. 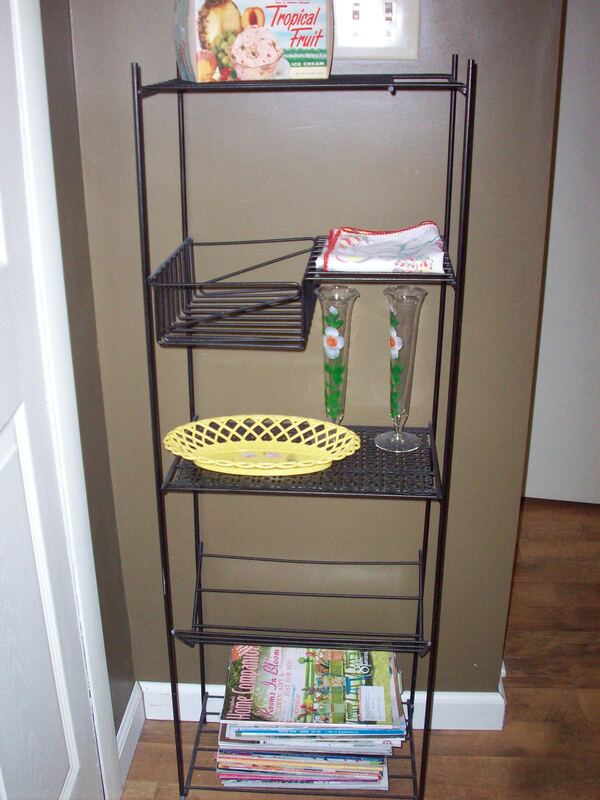 This magazine rack was also $1 at an estate sale. 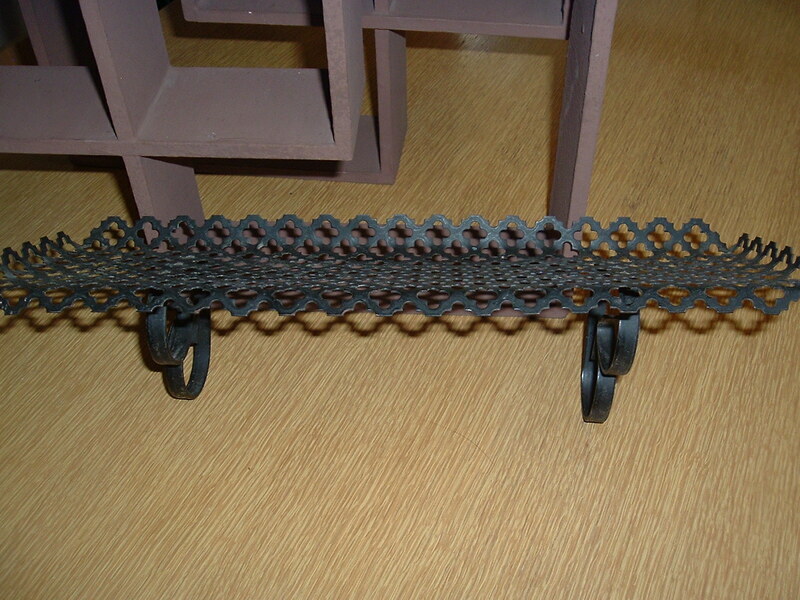 It held Christmas gifts on the hearth during the holidays. 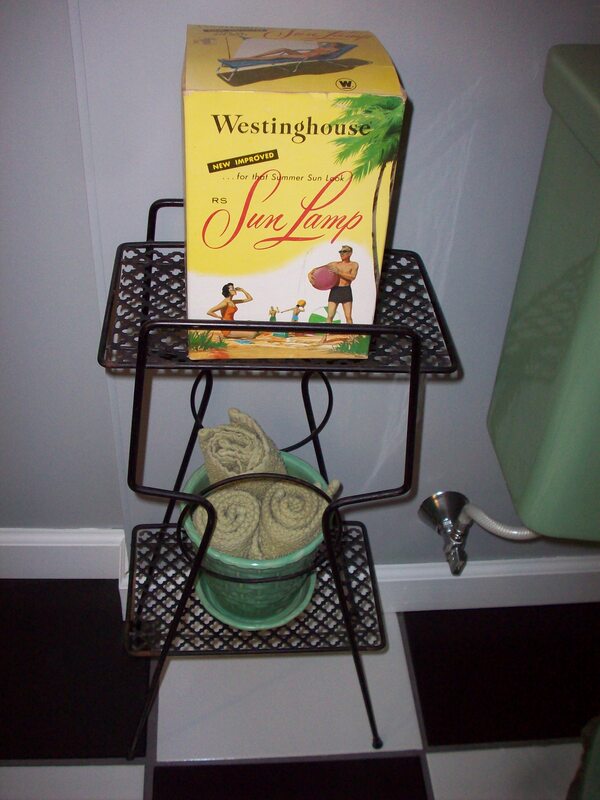 This piece is a plant stand that is now used in our tropical themed 3/4 bath. I think I paid $12 for it at my shop. 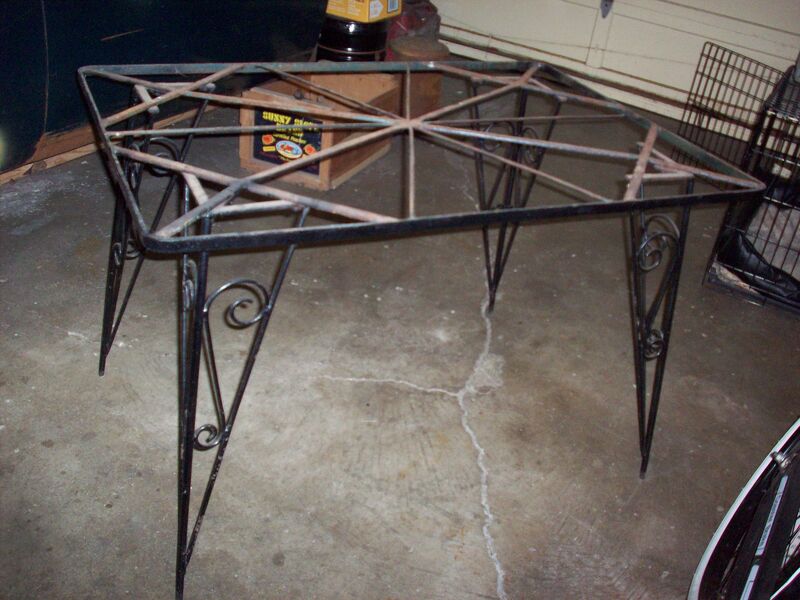 And here is our latest find, this cool wrought iron dining table snagged yesterday at a moving sale for $10!!!! I know it technically does not fit into the catagory of “lightweight” like the rest of these items, but it is black and is sort of metal! Well there you have it folks. What do you think? Is there that much black metal stuff available in your area? How about prices?